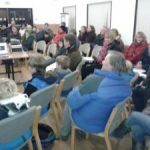 Friday 6th December saw the monthly stargazing evening in Dalby Forest. The skies looked hopeful despite a mixed forecast whilst society members were setting up their equipment in the Low Dalby courtyard but before the evening started, the skies completely clouded over. Around 60 members of the public still attended the event including groups from York Ebor Explorer Scouts and Millthorpe School, York, despite the weather. In the warmth of the Community Resource Centre society treasurer Mell Jeffery FRAS gave a talk on telescopes and other equipment including eyepieces, books and star atlases. As the cloudy skies continued, society secretary Andy Exton FRAS then gave everyone a talk on the winter skies including the constellations of Orion, Taurus and Gemini, their mythology and the deep-sky objects contained within them. Following the talks and continued cloud, attendees were then able to look at some of the equipment close up and ask any questions they had on the hobby. Many thanks to Neil Graham for also assisting with the evening. This entry was posted in Events, News, Public Observing and tagged Andy Exton FRAS, Community Resource Centre, Dalby Forest, Gemini, Mell Jeffery FRAS, Millthorpe School, Neil Graham, Orion, Public Observing, Scouts, Taurus, telescopes, York Ebor Explorer Scouts. Bookmark the permalink.